A scene from the Robot Monkey Sports Network. Think about this for a second: monkeys that are robots, fighting. Or to put a finer point on it: robot monkeys smashing into and hitting one another until your local bar is littered with shards of broken plastic. This Saturday, Brooklyn takes on Manhattan in the Robot Monkey Wars Chimpionship II at t.b.d. If you don’t know what the Robot Monkey Wars are -- well obviously you haven't lived -- but don’t just dismiss it as a bunch of drunks playing with remote control toys. OK, well, yes, that’s exactly what it is essentially, but it is also about art and artists and supporting both. And, we can't stress this enough, it's about robot monkeys fighting. 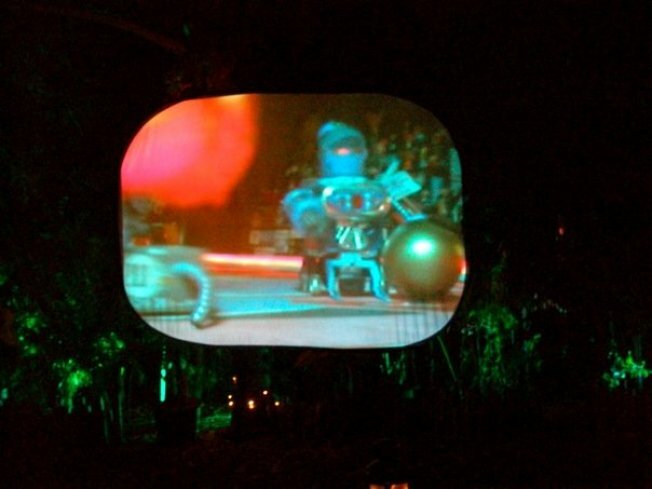 Dan Walker, whose multimedia work has been compared to that of Alexander Calder, founded the Robot Monkey Wars as a commentary about the abundance of advertising in sports. Well, it also turns out that advertising is a good way to make money, and in this case the proceeds are benefiting MyPAC (My Private Art Club) an international organization and collaboration that allows “local” artists to bring their work to other neighborhoods around the world through group shows and events. Also, it is way cool watching robot monkeys fight. This time t.b.d. in Greenpoint, the industrial space née ultra lux beer lounge, is acting as stadium-slash-art gallery and Absolut and Jameson are on board with drink specials from 6-8 to encourage maximum drunken button-mashing carnage. The robot monkeys, as is all of Walker's art, are fashioned out of found objects such as old toys. Sure, it seems a little silly, but just think, is it any sillier than what people usuallydo at bars?